Oh no! I'm a little belated in my posts this week...sorry about that. But lets forget all about that and move into the super fun sweet I have for you today! Yup, that is cake. Shaped like an egg. These were so much fun to make. I got this idea from Cupcake Project last fall and was waiting and waiting for Easter to come around this year just so I could try it out! The first step of this is to empty out your eggs. Make a small hole in the top of the egg with a pin or a corkscrew, the peel back bits of the shell until you have a small hole, big enough to put the end of a piping bag through. Then pour the egg out. I used a chop stick to scramble the yolk inside so it would pour out easier. The next step is to rinse the empty shells out with water and then to soak them in salt water for about 30 minutes. Dry the eggs hole-side down on a paper towel and mix up your cake batter! Mix the flour, powder, soda and salt together and set them aside. In a large bowl, mix the eggs and sugar until creamy. Add the butter and the lemon extract and mix until integrated. Stir in the dry ingredients. Lastly, add the sour cream and mix until smooth. At this point I separated my dough into 5 small bags and added some fun spring colors to them. Place your empty egg shells in foil-lined muffin pans for support, then pipe in your dough. These are really fun to eat, just crack and peel like a hard-boiled egg. I didn't have any problems with shell sticking to the cake at all. This is one of the earlier models of electric ovens from the 1960s. Early enough that it doesn't even have a window in the door. Yeah. I kid you not the oven delivery guys laughed at it when they picked it up. Anyways, a tragic even occurred this past week. Right in the middle of cooking dinner the oven just gave up. It made a loud 'pop' noise and the heating element went out. Right before Easter. With company visiting. I had a little bit of a meltdown. I was unnecessarily excited about this so we decided to have a little fun. 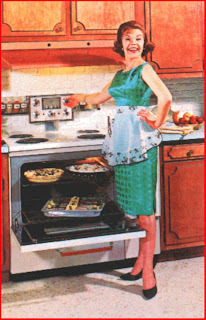 And now, so you can also enjoy our fun, here are some pictures of me re-enacting 1960's oven advertisements. So there you have it, or rather I have it. I can't wait to test it out!